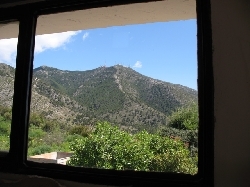 Beautiful, private 1 bedroom apartment on an artist's estate perched high on a plateau with totally unobstructed, 360-degree views of the entire Coast, Gibralter, and on a clear day, the mountains of North Africa. Here, time stops, and one is enveloped by pure silence, and pure peace. Nestled among the fruit orchards, olive and fig trees, complete with an immaculate 12 by 5 meter PRIVATE SWIMMING POOL, Finca San Anton makes for a perfect and unforgettable Spanish refuge. The apartment, like the house to which it is adjacent, was designed by artists intent on maintaining the uniqueness of this location. Towering ceilings and windows allow the light and views to come pouring in. The unit is fully furnished with ample desk and storage space; a king-sized bed (or two wide singles); wireless high-speed Internet connection (Wifi); satellite TV (with plenty of English programming); DVD; a washing machine; and a spacious bathroom. 2.5 meter glass double doors open to a terrace with views of the entire coast as well as a sculpture garden. The ceilings are so high, that a charming and one-of a kind loft has been built into one end of the main space. 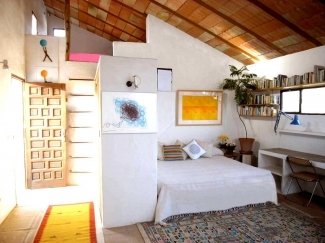 Accessible by ladder, with two windows, a desk, and an additional single bed it is perfect for a guest or a child. The kitchen is brand new and fully equipped, with four-burner stove, oven, microwave, juicer, Brita water-filter, electric kettle, coffee makers, fridge/feezer and marble counter-tops. A courtesy selection of "starter food supplies" (eggs, milk, bread, butter, jam, fruit, coffee, tea) for breakfast and snacks will be there when you arrive. Eat inside or on a terrace overlooking the Mediterranean. Terrace is equipped with sun chairs, sun umbrella, tables, a small barbeque, etc., and is sunny all day! Adjacent to this unit we also have a very comfortable guest room which contains one single bed and one double bed. This room in not included with the apartment but can be rented additionally. 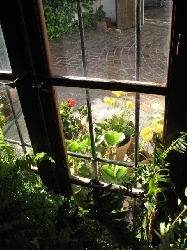 The grounds offer a quiet country paradise with olive and fruit trees, lawns, and many years of tasteful gardening. There are ruins of a Moorish fortress just a few meters from the house and many scenic walks and hikes directly connected to the property. By day, chart the sun's progress as it moves across the perfect blue sky, and shimmers on the surface of your beautiful PRVATE SWIMMING POOL; by night sip red wine as the lights of the Coast twinkle far below you and the moon rises above the Sierras. 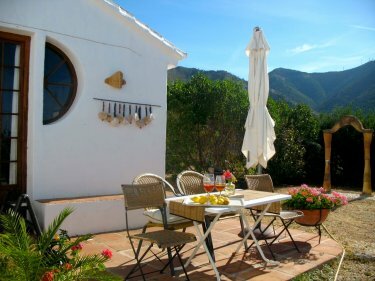 Finca San Anton is located in the countryside, 1 kilometer East of the town of Mijas (a three minute drive or 15 minutes on foot). Mijas combines the best of "Old" and "New" Spain. Spectacularly preserved, it contains tiny cobblestone streets, homes thick with hundreds of years of whitewash, chapels, churches, and priceless plazas. From Mijas, a 15 minute drive down the hill to the coast takes you to bustling Fuengirola, complete with beaches, malls, markets, train and bus stations. The Malaga Airport is a 20 minute drive; and 30 minutes takes you to Malaga, the capital of Andalucia. Any point along the "tenderloin" of the Costa Del Sol - East towards Torremolinos, or West towards Marbella - can be accessed in under half an hour. Private shiatsu, yoga or art classes (drawing, painting, sculpture, pottery) can be arranged upon request. There is also a gorgeous new health spa/gym about 7 minutes away (Nagomi Spa). The location is ideally situated for a multitude of day-trips and get-aways. 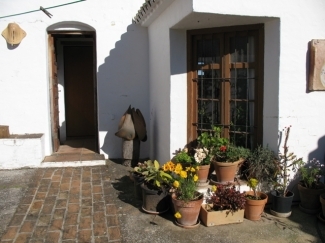 Though the property is within walking distance of Mijas we strongly suggest renting a car for your stay. We had a great time and are already missing the place - as your photos suggest, everything about it is unique! 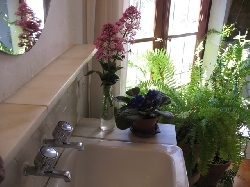 �The apartment was great, bright and airy with everything we needed. 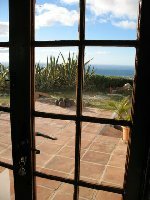 In the morning we would pull back the curtains, open the doors and view the ocean, with a fresh cup of coffee and the sound of the birds....this is a world away from London. 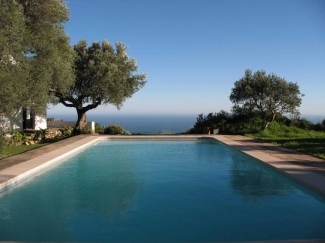 We loved the privacy, spectacular views, pool, fruit trees - I had never eaten fresh figs before! Tranquillity, culture ...the list is endless. Your hospitality was very much appreciated, and we hope to visit again (if you'll have us). island for one - far too short! - week. the town and you will be taking home some wonderful photographs. San Anton will fit all of these requirements. deck patio from which I marveled the vistas. Thank you for letting us share your wonderful house and art with us. We really felt away from the al the tourist-buzz, and you are a wonderfull host. And what a view !!! Truly breathtaking. It was everything we had whished for, and then some. We would defenetely recommend it to any couple loving nature and enjoying peace on your very own mountain top. Prices are for the property per week/month in euros. Five (5) night minimum stay. 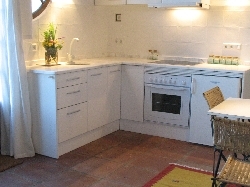 For rentals of 3 weeks or more a deposit of �100 is required against property damages, to be returned at end of stay. Electricity costs will be paid at the end of stay. 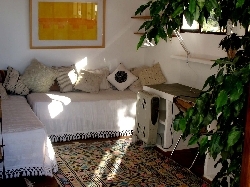 Adjacent to the apartment above we also have a BEAUTIFUL GUEST ROOM that may be rented additionally. It contains one double bed and one single. �35 per night; �245 per week. JUNE, JULY, AUGUST and SEPTEMBER ARE SWIMMING MONTHS! COME ON IN, THE WATER'S WARM! Note that prices are higher for weekly rentals during Christmas and Easter.